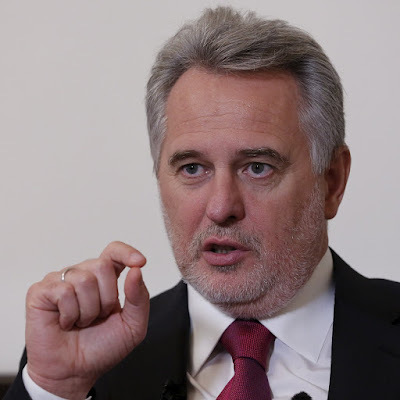 VIENNA, Austria -- In a suite of grand rooms inside a Habsburg-era building in Vienna that bristles with security, Dmytro Firtash sips a cup of tea and speaks quietly but deliberately about Ukraine, the country of his birth that he has not set foot in for nearly two years. Firtash, long seen as pro-Russian, has lost considerable influence in his home country since the revolution. Critics claim Firtash personifies the country’s class of voracious oligarchs, who made their fortunes while preventing Ukraine’s economy from developing properly. He had myriad business interests, wide-ranging political influence, and was a close confidant of former Ukrainian president Viktor Yanukovych, who was ousted in the Maidan revolution in February 2014. For years he was a key figure in the country’s murky gas industry, arranging and profiting from key contracts to import central Asian and Russian gas to Ukraine. But details of an Austrian court case, and FBI emails seen by the Guardian, suggest that Firtash has also been a major player in the battle between the west and Russia over the future direction of Ukraine. A fortnight after the Maidan revolution toppled Yanukovych, armed police burst into Firtash’s offices in Vienna and arrested him on a US warrant. He was charged with bribing Indian officials to secure a titanium deal. However, Firtash’s aides claim the charges were politically motivated and aimed at removing the businessman from the Ukrainian political scene at a vital moment. In a rare and surprising rebuff to Washington, an Austrian judge agreed, dismissing a US extradition request in April 2015 as politically motivated. Emails from the FBI to Austrian authorities strongly support the theory that American moves against Firtash had been motivated by political concerns. Sidelining him at the moment the Maidan revolution succeeded may have been part of a hands-on strategy designed to birth a new pro-European government. Firtash denies he was pushing Russian interests in Ukraine, but in an interview with the Guardian, he says he was a longtime sceptic of a free-trade agreement with the EU. The Maidan protests were triggered when Yanukovych pulled out of the deal and said he would turn towards Russia instead. “I told everyone we should bring Russia to the table and discuss it all together,” says Firths. Before Maidan, Russia and the west insisted Yanukovych had to choose one or the other, and Firtash’s position – borne of his contacts and business interests in Russia – perhaps made him an inconvenient influence in western eyes. Firtash has long been linked with business interests in Russia. Born in 1965 in a small town in west Ukraine, Firtash moved to Moscow in 1988 and took up residence in the Rossiya hotel, just off Red Square. It functioned at the time as a kind of informal stock exchange, and Firtash met would-be businessmen from all over the Soviet Union, particularly from the central Asian republics. “It all started with powdered milk. We sent [Uzbekistan] powdered milk but they didn’t have any money so they paid us in cotton. We sold the cotton in Europe and got our first money,” he recalls. The same thing happened in Turkmenistan, where Firtash was paid in gas – the start of what would become a long and controversial involvement in the trade. A Wikileaks cable recounting a 2008 meeting between Firtash and the US ambassador to Ukraine claimed the businessman had ties with Semion Mogilevich, a notorious mafia don who was until late last year on the FBI’s 10 most wanted list. Firtash fiercely disputes the contents of the cable and claims he never said this to the ambassador. Firtash’s gas contacts led to the establishment of RosUkrEnergo, a middle-man company that made huge profits while delivering central Asian and Russian gas to Ukraine. A Reuters investigation found Firtash had been extended credit lines of up to $11bn (£7.8bn) by bankers close to Vladimir Putin, which helped him expand his empire. The timing of US moves against Firtash align intriguingly with political developments in Ukraine. An initial request to arrest Firtash was sent in late October 2013, just after Yanukovych had met the Russian president in Sochi and suggested he might not sign the EU deal. A few days later, the US assistant secretary of state, Victoria Nuland, met Yanukovych in Kiev, and the Ukrainian president then promised he would sign the deal, Nuland said at the time. The day before Nuland’s meeting, a flurry of US officials emailed the Austrians asking them to call off Firtash’s arrest. The timing might have been a coincidence, but one of the emails, from the FBI’s legal attache in Vienna, strongly suggests it was not. The email, a copy of which has been obtained by the Guardian, noted “several discussions between senior officials from the US Department of Justice, US Department of State, and the FBI in Washington DC resulted in the decision to not pursue an arrest of this individual at this time, but to await a more opportune moment in the future that better fits the current investigative strategy”. It is not clear why senior State Department officials would be involved in the decision to rescind an arrest warrant. When contacted by the Guardian, the State Department, Justice Department, FBI and US embassy in Kiev all declined to comment on why the request was made and then rescinded, or why senior State Department officials had been involved in the decision. Russian state media have long pushed various conspiracy theories that the Maidan protest was a US plot, and while there is no evidence for this, there are signs that Washington was pushing for personnel changes, with Nuland playing the key role. After Yanukovych refused to sign the EU agreement, US policy in Ukraine became more aggressive, says Mykola Azarov, Yanukovych’s prime minister, in an interview in Moscow, where he now lives. He recalled a meeting with Nuland in Kiev on 10 December 2013, in a trip during which Nuland handed out biscuits to protesters – an act that would come to symbolise Russian media claims of US meddling. “She said to me, ‘prime minister, the best way out of this crisis would be to form a national unity government’; that I should resign,” says Azarov. In an intercepted telephone call leaked in early February 2014, Nuland and the US ambassador to Ukraine, Geoffrey Pyatt, discussed which of the opposition leaders they would like to see in government. It was hardly, as Russian media claimed, proof that the State Department was directing the Maidan protests, but it certainly showed they were more involved than might be expected in Ukrainian political appointments. With Ukraine’s political future in the balance, Firtash may also have been a problem. “The Americans thought he was going to interfere, and he probably was,” says a source in the business intelligence world with knowledge of the case. In London, Firtash enjoyed better contacts. In the days after Maidan, he had briefed the Foreign Office on events in Ukraine, in a meeting apparently set up by Conservative MP John Whittingdale and the Tory peer Richard Spring, both of whom are part of the British Ukrainian Society, set up by Firths. But even as he was briefing in London, the US reactivated the warrant in Austria, and this time police swooped, removing Firtash from the Ukrainian playing field. On 12 March 2014, armed police stormed Firtash’s office in Vienna and arrested him. He was released a week later after a €125m (£96m) ($135m) bail was posted. “Of course Firtash depended on Russia; the Americans were worried he could jump across to the Russian side because of his financial links,” says Azarov. From Vienna, Firtash continued to influence Ukrainian politics, notably meeting the current president, Petro Poroshenko, and former heavyweight boxer Vitali Klitschko in the city shortly after he was bailed. Poroshenko insisted he had not planned to meet Firtash, but soon after the encounter Klitschko, who has been seen as close to Firtash, pulled out of the presidential race, leaving Poroshenko an easier run, and stood for mayor of Kiev instead. Many political analysts saw this as a sign that even after the Maidan revolution, billionaires were still taking key political decisions. The Austrian decision not to extradite Firtash has left him free to travel, although the US is appealing. He had planned to return to Kiev on the day the Guardian interviewed him in early December but abandoned the trip after the interior minister said he would be arrested at the airport. He had sent heavily armed men there to wait for Firtash despite the fact there were no charges against him. Firtash wanted to travel to Kiev to promote his initiative, the Agency for the Modernisation of Ukraine, which is supported by Lord Risby and Bernard-Henri Lévy, the French philosopher, as well as a gaggle of former European politicians, who have come up with a number of reform proposals for Ukraine. Cynics say this is merely a way for Firtash to buy friendship and retain influence amid the new government’s stated policy of de-oligarchisation. Firtash himself admits that he has lost a lot in the past two years, though he would not say a figure. “I’ve never met anyone in Ukraine who considers these proposals seriously,” says Sergei Leshchenko, a former investigative journalist who is now an MP. There is little sympathy for the plight of someone who many consider to have been a negative influence for years. Firtash says all the smears against him are political. He claims the events after Maidan, in which Russia annexed Crimea and fanned the flames of a civil war in eastern Ukraine, prove his point that Ukraine should not have to choose between Europe and Russia.